Published: April 21, 2011 at 06:36 p.m.
Candice Crawford can really come through with a gift that really excites Tony Romo. 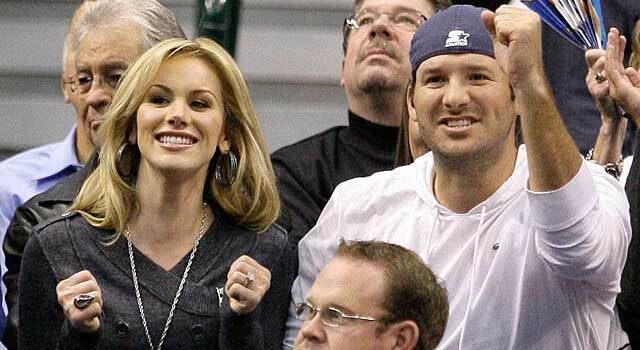 Birthdays have a special meaning for your fiancée Tony Romo. He famously dumped Jessica Simpson one day prior to her birthday. An obvious genius move if you ever forget a birthday. Truly an instant classic, rivaled only by the pre-Christmas dump followed by the post-Valentine's day reunion. So with that in mind, we would like to offer some gift suggestions for Tony. A lot of times a cruise is an awesome gift. Or, at least it would be if his previous girlfriend hadn't given him a boat for his birthday. It's going to be hard to top that one, but that is why we are here to help. Let's cut to the chase, Candice, your fiancée isn't likely to win one of these on his own. No shame in that. A lot of quarterbacks better than Romo -- Dan Marino, Dan Fouts, Jim Everett -- haven't won a Super Bowl either. So why not comb eBay looking for some replica rings? And Cowboys players, including former Super Bowl MVP Larry Brown, have sold their own rings previously. Seriously, what's Lin Elliott doing with his ring? Candice, I have to imagine that you never saw Romo sing "Take me out to the ball game" prior to your guy's courtship, or else I would have to imagine that this union never would have happened. Romo's version ranked somewhere between Ozzy Osbourne's version and Carl Lewis singing the national anthem. A nice trip can be a really classy gift idea, Candice. Make it some exotic locale like Fiji, Ibiza or Rome, Ga. But whatever you do, make sure the trip is not to Mexico. Don't ask. Just never ever, ever, ever mention Mexico to Tony. Never! There is no telling you that Tony certainly loves his golf. We all looked on with great anticipation as he tried to qualify for the U.S. Open. So we can think of a better, more thoughtful gift to give than a round of golf with up-and-coming PGA superstar Rory McIlroy. Trust me when I tell you that Rory and Tony will have plenty to talk about. Just kidding, nobody likes leftovers for their birthday.